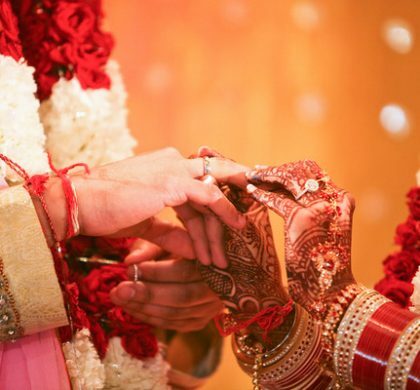 Indian wedding decorations bear testimony to the fact that fairy tales can be recreated on Earth. Decorating the venue requires meticulous planning with an eye for detail and precision. 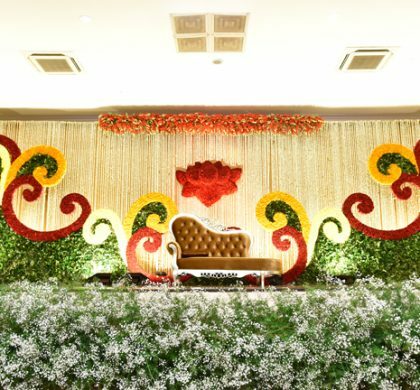 Whether you are choosing flowers for the stage or decking the wedding aisle with a carpet of roses, you require help from a professional wedding planner who will execute your ideas. 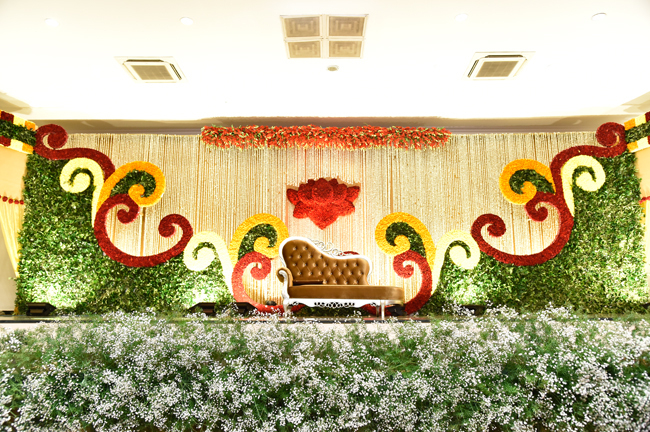 You can include vintage items on stage or place colourful pillow for ladies sangeet. Depending on the theme and culture, you can choose flowers and decorative items. 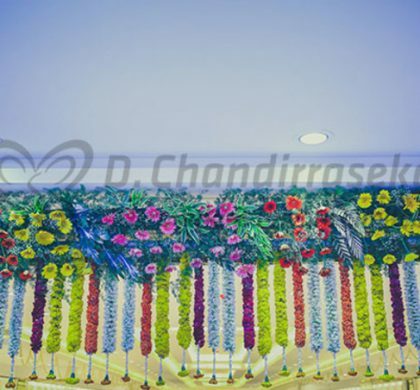 Place a large swing near the mantap and decorate it with flowers. It makes for a great prop and can be used in photo-shoots. In addition to these, a fabric drape creates an ethereal look. Style the drapes in any fashion and use them to cover the entire ceiling or partially conceal the walls. This gives a spacious look to the room and makes your venue look like a different place. Match the clothing around the chair with the drapery on the wall, or you can choose contrast tones. Hoops-Hang hoops adorned in plants and flowers. This idea can be used as a backdrop for the nuptial vows or a photo booth. Helium Balloons– Use semi-translucent coloured or white balloons to create an atmosphere of simplicity and gaiety. What was construed as a decorative accessory for children’s birthday has turned into a symbol of style and flair. Flowery ceilings – Decorate the foyer with an intricate floral setting and watch all eyes turn to the ceiling. Use contrasting colours for the wall arrangement and the floral blooms. Get creative and hand inverted flowers on the ceiling. You can mix them with accessories like a ribbon, crystal strands or a chandelier. 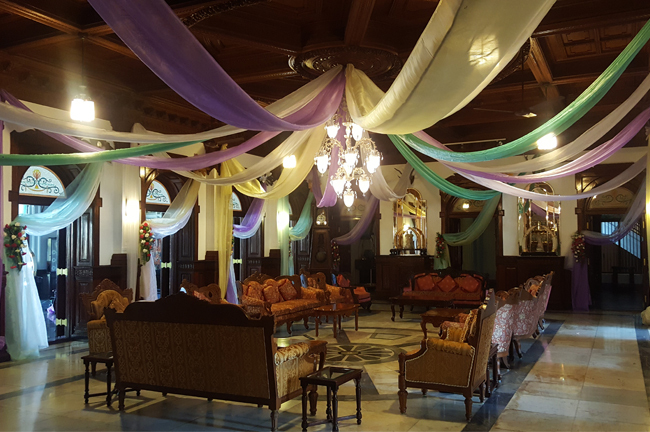 Full ceiling décor – Adorn the ceiling with a mix of flowers, greenery, ribbons and chandeliers to make your venue look spectacular. Ribbon-decorated roof– For ceiling decoration, silk ribbons can be used as streamers. Insert lightings in between and you will witness a magical wedding unfold in front of you. Chinese lanterns– Hang colorful Chinese Lanterns with a hula loop for an astounding effect. By adding delicate lights in between the loops, you can enjoy a dazzling effect at a small price. Foliage garlands– If you have an outdoor wedding, use fresh foliage decorations for the wedding which helps enhance the ambience of the wedding. Creatively arranged branches– Decorate the ceiling with branches in various shapes and sizes. Accentuate them with floral beads, led lights or clusters of flowers. Flower decoration accessories like balloons, loops, foliage, chandeliers and ribbons add a dramatic effect for a venue. If you have difficulty deciding the theme, look at the size of the venue or the reception area. A floral ceiling looks good for large halls while buntings create a charming effect at night. When you say happily ever after, you can look back and cherish those memories.